If we are talking about unwanted hair, I believe everyone of you here are willing to get rid of them forever! Luckily, I am the type of person that doesn’t have to deal with excessive hair. Truthfully speaking, mine is very tolerable, light and thin. Waxing is still needed every month to maintain the smoothness on my skin. Last weekend, I went to this place called Pink Parlour. They are available at Kemang Village, Pacific Place and Grand Indonesia. I visited the one at Pacific Place to try the Alpha Light Underarm and Half Leg Waxing. Some of you might be wondering, what is Alpha Light? You will get the answer down below with more details. But let me tell the complete story from the beginning I got there. So once I went in to Pink Parlour, they told me to change my shoes to slippers to make everything easier and comfortable for the process. After I changed my shoes, I had a conversation with this worker who is in charge to do the Alpha Light and Waxing for me, we went in to a room and she began to prepare the strip wax. They use quality strip wax for super efficient and fast waxing. Different formulations are available to suite different skin type and hair needs including hypoallergenic formulation. No breakage or sticky residue! Half Leg waxes from above the knee to toes. Before she applied the blue wax, she sprayed a toner to a cotton cloth and caressed them on to my skin. The toner felt a bit cooling. 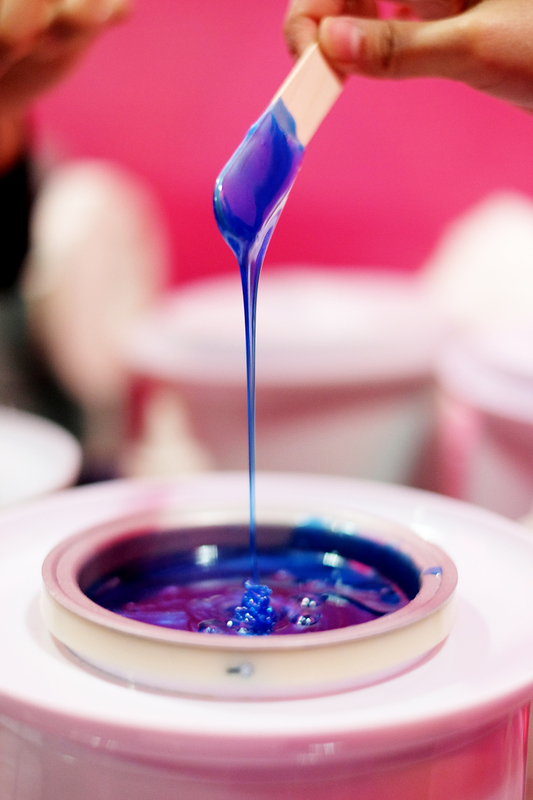 After that, she spread the sparkling blue wax onto my skin. As you can see, I have a slightly thin hair on my leg. It is not that disturbing, but I don’t like to keep any hair on my body. Except for eyebrows and eyelashes! Lol. After the wax were spread, she took a long cloth and stick it on top of it. She immediately pulled off the cloth and ta-daaa! You can see the difference in just a second. The result is super smooth and not a single hair was left out. Compare it to the one that has not been pulled out, you can still see the hair texture slightly. I really find this wax is different then the caramel-based one. They usually leaves a sticky feeling after I waxed and a bit more painful. But I find this one is more precise in pulling out the hair and less painful. After I was done with the Half Leg Waxing, I was prepared for the Alpha Light Underarm, Still in the same room but with different machine and process. Alpha Light hair removal is a system to get rid of unwanted underarm hair in a jiffy and it is also semi-permanent. All you have to do is to take 7 Alpha Light Sessions and Voila! It will make your hair grows a lot slower. After you done with all the sessions, you will only need to get back once a year to maintain the hair growth. They are less painful compared to IPL as they only use 640nm. She gave me this eye cover to protect the eyes from the light. As the machine’s light are actually harmful for the eyes. Even the worker also wear something that looks like a black sunnies. Once I am prepared, she put a very cool gel onto my armpit, spread it and took a machine that looks like a gun. The Alpha Light feels like an ant-bites, it is not that painful but you can definitely feel something out of it. A little tips for you, please grow some hair at least 2 millimetres before this Alpha Light Session, as it will be more effective to have some hair on it. Mine is very thin and very minimum so you can barely see it on the picture. Will need to grow some more for the 2nd session. After several ant-bites feeling, she put an icepack on top of my skin to make it less painful and relaxed. She did the same thing for the left armpit, The process doesn’t took very long. This is the result after I finished my 1st Alpha Light Underarm session. I will keep you guys updated until my last session so you can see the process in detail. Looking forward for the second one.